I shared with you guys my state of mind early last month. I figured why not again. Honestly, I didn't have a topic lined up today, just a clever little post title. 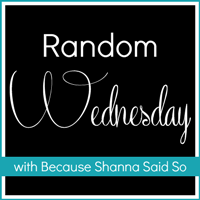 So, chatting about feelings seemed like an easy route for post content, plus it is Random Wednesday after all. Heart Broken -Logan admitted that she doesn't believe in our Elf on the Shelf anymore. She said she knew last year, but played along with the "game". I wanted to continue the magical lies, but I didn't have the heart to keep the story going. She is on the fence about Santa Claus, but I think we have her believing one more year. I know this is not what Christmas is all about, but it rips me up inside knowing that Santa will most likely not exist to her this time next year. They grow up too fast. At least she is keeping her lips sealed for Landry and all her friends at school. I may or may not have threatened her if she spilled the beans. Stressed - Hmmmm, where should I begin? Holiday gift buying, Christmas cards need to be addressed and mailed, Ross's birthday is tomorrow, hosting company Christmas party at our house Saturday, need oil change, car registration and inspection two months expired (Dad, I swear I am doing it this week), no food in the fridge, laundry overflowing, dishwasher broken and Landry's fish bit the dust (total meltdown in our house). I won't go any further. Just SO much going on right now I need a brown paper sack. Beyonce-ful - In brighter news, I am going to see Beyonce in Dallas on Monday with two of my best gals. We bought our tickets months ago and have been counting down the days. I love this woman, possibly obsessed...her voice, music, choreography, legs and just her in general. I am sure I will be blowing up Instagram all day Monday. Just warning you. Joyful - All the stress at the end of the day is worth all the joy that this time of year brings. Yes, I am running around like a chicken with my head cut off. I am sure most of us are, but isn't this the most magical time? At this very moment I am soaking it all in; Christmas movies on every night, Peppermint Twist candle aroma filling my home, twinkling lights sprinkled around the house, the kids being on their best behavior because Santa is making his list, random acts of kindness from strangers, the hustle and bustle at the stores, peppermint chocolate chip milkshakes at Chic-fil-A, spiked apple cider by the fire, burlap bows, Mariah Carey's All I Want for Christmas on repeat and the list goes on. I just need to remind myself that this is the season of giving, joy, love and celebrating my Savior. All the other "stuff" really is just icing on the cake...thick, homemade, vanilla icing with lots of sprinkles. It's a good balance of emotions you have to make you feel all and all human! Thanks for sharing and thanks so much for hosting. Enjoy the lead up to the silly season. Bummer that Logan is doesn't believe in Elf on the Shelf anymore. My son is starting to question things and I am so not ready for him to not believe yet. He is already not wanting to kiss me goodbye when I drop him off at school and he is only 5!!! I would love to see Beyonce in concert - she is just awesome all around. I am sure she will put on an awesome show! LOL..I just loaded the pictures of what I wore yesterday and the only thing I can say is "GREAT MINDS THINK ALIKE" you look awesome and your outfit is fun and cheerful. I can completely relate to your holiday stress! We have so much going on right now and since my husband works retail, he's pretty much MIA until after Christmas. SO MUCH to do!! Also, super-obsessed with this fringe top! It's not something I would have ever have picked up off a rack, but I love the way you styled it here!! I love this look! I hope your stress level gets better soon! We're hosting a Christmas party Saturday too - I'm trying to prep way in advance! I saw Beyonce a few months ago and she is amazing, you will have fun. Great look! Your hair is gorgeous! I'm experiencing the same thing here with Reagan and Santa. She is seriously questioning it but is also playing along for her two little sisters. Thank God! I realized a gap in my schedule next week for work and I'm elated I can just do holiday things and soak up some time. Ahhhh so jealous you're going to go see Beyonce live! I love that woman as well :) Love your boots, they look uber comfortable! Love the fringe sweater, Shanna! Thanks for sharing, youu are so inspiring! Thanks for hosting the link up! You look so pretty. This is a good look for you. Love the sweater and your hair! Your openness is always so refreshing. It's nice to hear someone else's life is a little hectic and messy at times. I never would have picked up this fringe top, but I love it! Well done! I can only imagine....I'm so sad just thinking about the day that they boys figure everything out about Santa and our Elf. I think I found out in second grade about Santa and I was seriously devastated. AND I told my cousin and got grounded until Christmas. Bad girl... Love that look by the way and trust me, I totally feel you on the stress! I can totally relate to the holiday stress though it is my favorite time of year! The calendar is overflowing and so much to get done. Hope you find some time to de-stress and have a few moments to breathe! Your bag is so lovely! Oh the bitter sweet holiday season, it comes with the territory you will survive. So jealous of your Beyonce concert, trust me cant wait to see the updates on instagram. If ever you're stressed...you don't look like it Shanna. You in fact look great in the boho inspired look. Dont worry....just take it all in!!! Happy Holidays! I feel the same way right now -- stressed and blessed! Ahh, thanks for the perspective this time of year. I have way too many stresses wearing me down. There's a lot to celebrate though, so much. Love the fringe and boho vibe of your outfit today! Aw man, tis the season…..it's stressful and wonderful all at once! The concert sounds amazing! Girl have fun at that Beyoncé concert! I would loooove to see her! I bet she is fierce live! 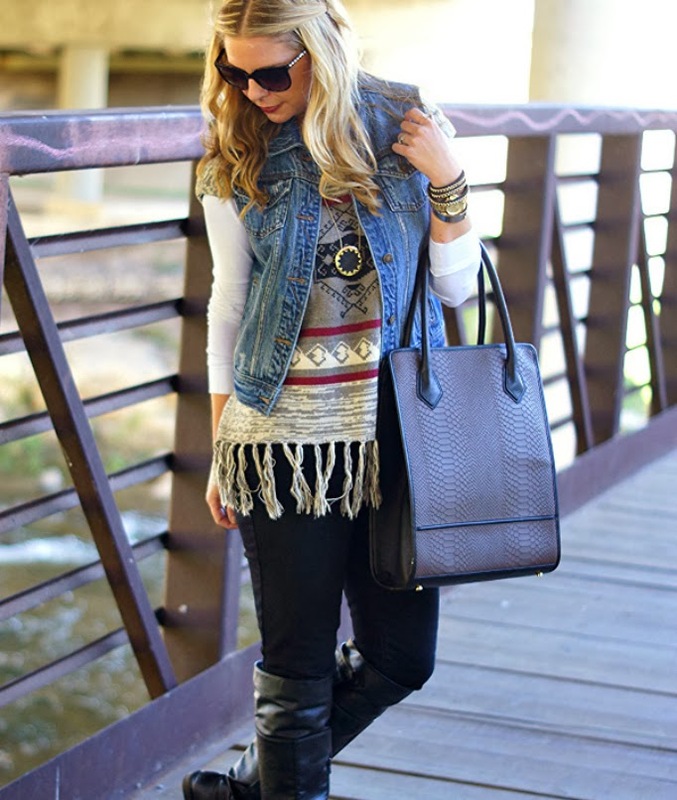 LOVE your layers here and that fringe top is amazing! We have almost the exact same stresses. Finally got the Christmas cards out this morning, Christmas parties all around, got car inspected yesterday, but didn't have time for the oil change, we have no food in our house and no clothes either because I refuse to spend the few moments of peace I get every night doing laundry!! Love this look! That sweater is so fun! My hubby's birthday is Saturday and I still don't know what to get him or what to do for him. Men are so hard to shop for! omg you'll be in dallas!! i would say we should meet up but you're going to see beyonce. dangit i want to go! im sorry about logan and elf on the shelf, that would make me sad too! this is really cute! love the layering girl! Love this sweater! I had considered buying it but it was short on me:-( I have been eyeing ur necklace too for some time! I LOVE this bag–the structure is just amazing! I think the holidays can be a stressful time for everyone. It just seems like there's so much going on at once! Beyonce will definitely help you de-stress and relax, so fun that will be! 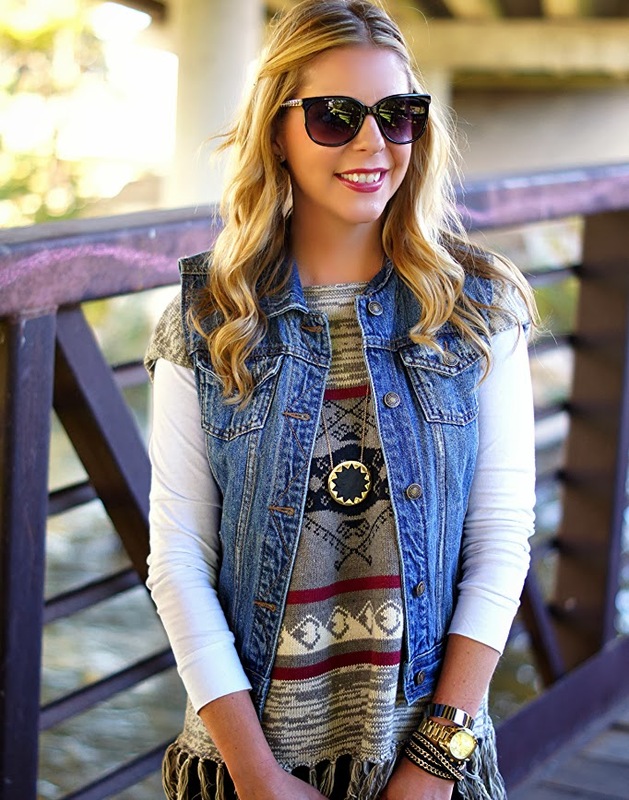 love this southwestern look! 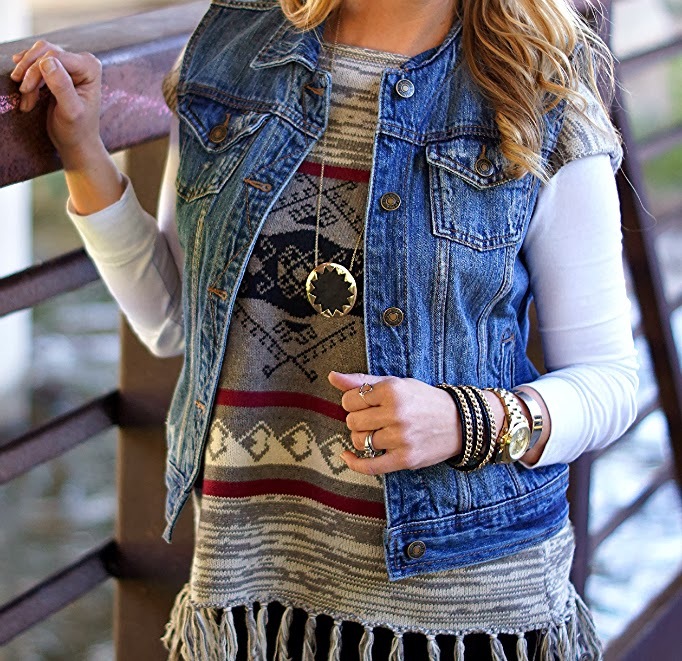 perfect layering with the jean vest on top. the holiday season is totally stressful, but it seems like you've got things under control! Cute sweater! I'm loving fringe lately! Thanks for keeping it real! I love the outfit as well! Deep breaths! You have a lot going on. What needs doing will get done, what doesn't didn't really need to be done. Sorry your girl is on the cusp of not believing...I think that's always tougher on the parents than on the kids. 1 thing at a time & you'll get it all done. Beyonce is a definite bright spot! :-) Love your look and wishing you a great rest of the week...XO! I'm loving that fringe sweater! So pretty! First, I'm dying over that fringe top, I need! Second, I agree with the stress of Christmas (gift buying, ugh!) and the joys (Xmas music, shows and treats!) It's such love/hate holiday for me, but having the kids makes it worth it. I think we have a couple of years left of Santa for my daughter, I can see how that is weird when they don't believe anymore, bittersweet, right? You know, I keep thinking that you can't outdo your outfits, but you do. Continue to surprise me my beautiful friend because I love this look! Beyonce-ful! Ha! That will be such a fun show!!! And wow you've got quite a bit on your plate! I hope you can squeeze some you time into there! Love the top. Very cute! Yay for fringe & Elf on the Shelf. Haha you could still do it for tradition's sake??? Haven't linked up in so long. Excited to be back. Happy Wednesday! You look like a rockstar! Love the knee high boots! I'm hoping the holidays become less stressful for you and that you can just enjoy everything! I'm sure your kids and family appreciate all the hard work you put into making this time of the year special! That's such a bummer about Logan. I think I was around her age when I stopped believing. Christmas is definitely insanely stressful but also a fun time. I'm loving that gorgeous bag!! My nephew is 2 and they live with my parents - we have an elf on the shelf and we're all so excited to have a kid who believes in santa in the house again! So, i can understand your heartbreak/disappointment!! LOOOOVE this outfit and have a blast at Beyonce!! Let me tell you, I am 30 years old and I have NEVER stopped believing in Santa. It makes me sad when kids do, but hopefully she will keep her ideas to herself for a while. And how have I not heard of Chick-fil-a's peppermint chocolate chip shakes?!?!? MUST. TRY. NOW! Love the layers! And your hair looks adorable curled and pulled back like that! Although this outfir isn't really my style, I DO like the way you've put it together. It looks comfy! We have had "Santa" in the house for years. With my niece just being a little over a year and a half now, Santa is back! Lovely look. I'm crazy about your bag, it's so cool! And your necklace is great too! You always get the best stuff at Forever21! awesome jackets for women ....loved the outfit..great post ! !